It's not like we didn't have papers... and photos... and invitations... and such... floating around before we had children. But, once we had kids those sorts of things seemed to multiply. And once our children started school, they seemed to multiply exponentially. Anyone else experience that phenomenon? And since I am one of those people that likes my refrigerator to stay clear of all of that kind of stuff...I had to find a place for it. That's where my Family Command Center comes in. I've had one in every house that we've lived in. And here's my version for this house. 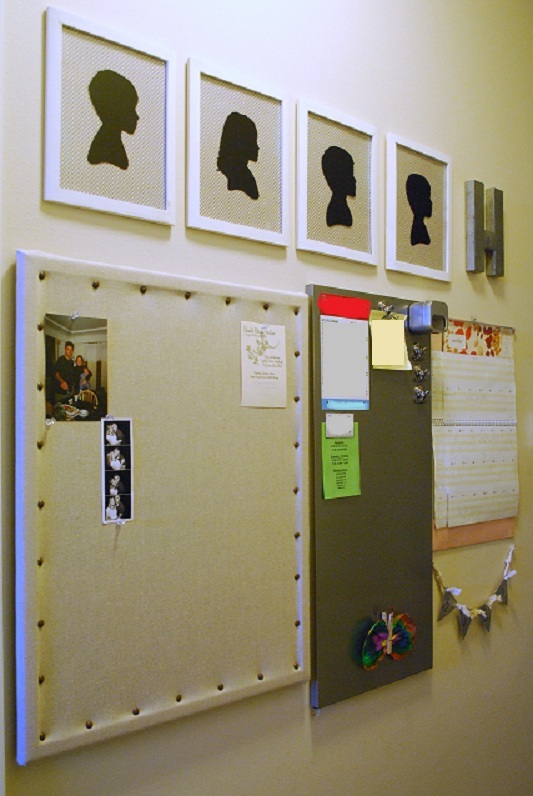 I knew that I wanted to have a bulletin board. And I wanted one that was fairly substantial in size. Then, when we were visiting my parents last weekend, I lucked upon this old corkboard sitting unused and dusty in my parent's basement, so I grabbed it and ran asked nicely if I could take it. Of course, the old corkboard was looking a little worse for the wear after sitting in the basement for so long. And so I covered it with some fabric that I repurposed from my boys' old headboards. I just wrapped the whole thing and stapled it on the back with my trusty staple gun. Then to make it a little fancier (because fancier is always a good thing, right?) I added some nailhead trim. And voila! A much prettier bulletin board was born. I put it up, along with a magnet board from IKEA that I already had, and our family calendar. 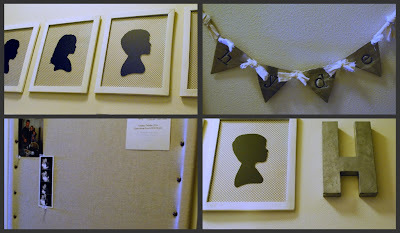 But the overall effect was a bit dull, so I had to "pretti-fy" it by adding in the DIY vinyl silhouettes I made of the kiddos, as well as a pretty stamped metal banner from Lisa Leonard, and my beloved Anthro "H" monogram. The overall effect was happy, and fun, and definitely prettier than just having those boards and our calendar hanging there. And now all of those papers, invitations, photos and what-nots will have a place all their own (and my refrigerator door will remain clean). Hooray for organization!! Can I hear a "woot woot"?!? Wow---pining this, LOVE it! That metal banner and the nailhead make the space for me. Very attractive way to corral all those papers and things - love the silhouettes above the working parts! Love how you transformed the bulletin board! This is a fantastic idea, my fridge needs to be rescued from clutter and I have a big, blank wall in my kitchen...I think this project is ideal, thanks! It looks great! I love how it all goes together so nicely! i love the nail head trim!